Devote some time and energy to designing the meeting’s agenda. Think of it as a journey that participants are taking together. Have you ever used something—a product, a website, a process—that wowed you because it worked so well? In this post, we detail how a user-centered meeting agenda can improve how your team collaborates. In most cases, positive user experience doesn’t happen by accident. If it seems like the creators had you in mind when they were designing, chances are they did. It’s called design thinking, and it’s something that we at ThoughtForm try to bring into everything we do. Design thinking is about putting the user first. It’s founded on careful consideration of their wants, needs, motivations, strengths, and limitations. According to this methodology, before you begin designing a solution, you need to have a deep understanding of the problem and how it affects people. This user-centered mentality can be applied to designing anything, from training courses to hospital chairs to banking apps… and yes, even meetings. We’ve all sat through our share of bad meetings. Mind-numbing, unproductive, disorganized. An effective meeting leader can certainly help a meeting run smoothly. But engaging in design thinking up-front will also go a long way. The most complex meetings are those that involve lots of participants or require a team to make a critical decision. These meetings can also be the most challenging to plan. In these cases (and really, in all cases), creating a user-centered meeting agenda makes it more likely that participants will be engaged, prepared, and ready to get things done. Let’s take a closer look at each action. As IBM explains in their Design Thinking Field Guide, “By establishing empathy with the user, designers are able to work toward outcomes that meet those needs more successfully.” So before you begin planning your meeting in earnest, consider who will be participating. Are they joining the meeting because they want to, or because they were told they had to? Are they there to learn? To teach? To co-create? Whether participants will be coming to the meeting with lots of background and opinions or not, design the meeting to help them shine. The most effective meetings promote creativity, collaboration, and action by providing an environment that makes participants comfortable sharing. Think about what you can do to help the group warm up and gain momentum early on. Participants should share buy-in for the meeting’s overall goal. But they probably also have their own side-agendas. Maybe the new manager wants to show her team that she values their expertise, or the new rep feels he needs to prove himself. Be aware of these types of personal goals, as well as potential “hot button” issues that could come up. Then determine how to best manage them—whether that means addressing them during the meeting, or not. You can use a “Parking Lot” to record ideas that are raised that aren’t critical to this meeting, but should be addressed outside of it. 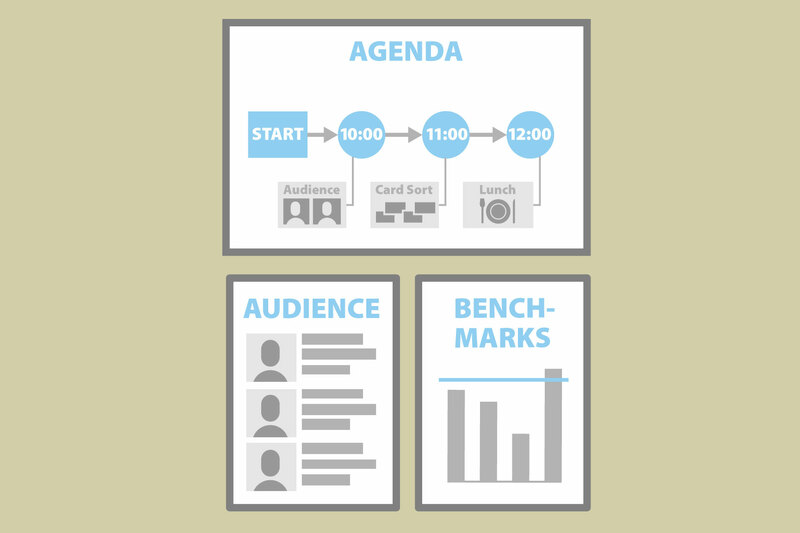 Be prepared to devote some time and energy to designing the meeting’s agenda. Think of it as a journey that participants are taking together. You can even create a visual agenda to serve as a roadmap in the room. The meeting agenda should have a theme, or an overarching topic that could encompass a few goals. For example, a theme might be “Finding ways to work more collaboratively.” Defining a theme helps you as the meeting leader design exercises and structure discussions. And it helps participants frame their thoughts and get in the right mindset to make strides. When you take this process-oriented approach, you’re able to hone in on the purpose of each exercise and discussion. IBM suggests that you “include only as many activities and as much content as you need to in order to achieve your goals.” Focus on the flow of inputs and outputs. The results of each meeting section should feed the next one. If you’re not sure how the group will use an exercise’s output, scrap it from the meeting agenda. Remember that on even the most carefully planned road trip, you might encounter a few bumps in the road. You may find you need to adjust course during the meeting, so think of the agenda as a flexible guideline for how you’ll spend your time. It’s okay to take some time from an exercise in the afternoon to give the group more time to work through a meaty discussion in the morning. A participant might ask a question that means you need to add in an exercise on the fly. Iterating to better serve your users—or meeting participants—is a good thing. Once you’ve planned your meeting agenda, it’s time to facilitate the meeting. This is where being a good host comes in to play. As at a dinner party, you should do your best to anticipate and respond to participants’ needs. Get there early to set up the room, hang materials on the walls, and test out the projector. If not everyone is familiar with the meeting location, point out the restrooms and emergency exits. For a longer meeting, set up a self-serve beverage and snack station so people can help themselves and keep up their energy. Finally, being a good host also means balancing the personalities in the room. Encourage participation, and tactfully help less outspoken members of the group break in to the conversations. We like to bring a stuffed bunny that participants can use to signal that someone is going down a “bunny trail” and should wrap it up. If needed, remind participants to take turns and be respectful. Everyone was invited for a reason; everyone’s ideas are valid. By following these key actions for keeping your meeting user-centered, you’ll set the group up for success. Meeting agendas aren’t the only important factor. Personality can be just as important.